Surely your baby girl is one-of-a-kind. 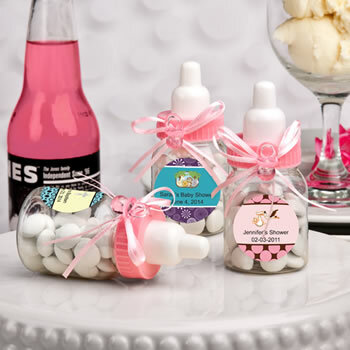 So, Fashioncraft offers these exclusive Design Your Own Collection baby bottle favors to make it easy and fun for you to create personalized one-of-a-kind favors to celebrate her special day. And, we're sure that the outpouring of smiles will make your day very special too! These are so cute! Everyone loved it. I filled them up with pink hershey's kisses to form the perfect return gift for baby shower for a girl. I paired these up with a couple more of stuff from the site. Was hassle free to order even with the custom pic upload. Had to stick them on the bottle, was packed so neat! I was dissapointed in these favors because a few of them were crushed in & wouldn’t stand up straight. One didn’t have the ribbon & pacifier on it, it was in the package, just not attached. I shouldn’t have to clue it myself. I didn’t realize any of this until I went to put the candy in them for my guests this weekend. Now I’m 3 short. Please don’t bother sending me 3 more, it will be too late! Everyone loved my party favors. I was extremely happy with my choices. They all came in perfect condition. I did accidentally knock the ribbon off of 2, but it’s an easy fix! They’re so so so cute! I can’t wait to give them out! When I received the package many of the bottles were dirty with residue glue. I had to wash the entire lot of them. Many of the bottles also had the pacifiers already unglued from the bottles. I would have sent everything back if I wasn't on a time crunch. After emailing they refunded me for my trouble, but I will NEVER be ordering from them again. Perfect favor for baby shower! I filled them with pink Hersey Kisses and they were definitely a hit! Very cute!! only thing is some of the little rattles had to be glued back on but very nice product, good quality, just enough to give your loved ones home with something. These are so cute. Filled them with mints for baby shower. Ordered them one week before shower and they arrived in time. I'm very happy with the final product. The price is also a decent amount. I purchase thelse bottles for baby shower, they are perfect. My order arrived quickly and in perfect condition. Great buy for a great price!! I ordered 100 of the little bottles with pink ribbon/pacifiers! When they came in about 15 of them were crushed, 50 of them the pacifier had fallen off and then the remaining ones were fine! So I had to fix about half of them so I could actually used them! After I fixed them I loved them! They were so cute and they were a hit at the baby shower! I just wish that they came ready to used instead of half of them being broken! These are super cute. I would've given them a higher rating, but at least half of the bottles had broken pacifiers that I had to glue back on. Other than that, they would have been perfect. I had to order two bottles for my daughter's baby shower. They arrived in a very timely manner. I was concerned that I had to order 80 of them to avoid an additional fee but It was a good thing I had ordered extras because the little pacifiers that should be glued on them fell off of at least 20 of them. Definitely a case of you get what you pay for but in the end they are very pretty and very worthwhile getting if you need favors. I bought these baby bottle favors for my baby shower and they were at my house within 4 days. It was amazing how quick they shipped and they are the cutest little favors. My shower is in a couple weeks and I can't wait for everyone to see them. Will go through nice price favors again for future needs! I am so happy that I found this website. The favors were the best price out of everywhere that I looked and included personal tags, where no one else did. They only took a couple of days to arrive in the mail. They look just like they do in the picture, adorable. I ordered 80 of them and there wasn't a flaw on a single one. I am very happy with my baby bottles! They got here pretty quickly and I did not find issues with any of them ( i ordered 90) I'm very happy and will definitely be using this site again. These baby bottles were PERFECT for our baby shower party favors! They arrived at a great time too. The only thing I noticed and did not like too much were that 99% of the bottles had what looked like a melted glue gun mark. Very distinguishable marks, about the size of a pinky fingernail. It didn't bother me much though, I put the stickers over them. I'd buy this product again though!